After working from his bedroom for two and a half years, Jason Ross launched JackThreads in 2008 — a men’s online shopping club that had yet to establish a payment system via credit cards. His first online sale featured a single brand and only sold three items, but the company quickly acquired several hundred members in the first three months. Today, JackThreads has almost 2 million members, over 500 brands and over 60 employees. Here, Ross shares his highs, his lows, his best advice and what he thinks is next for the online retail industry. The success of JackThreads roots back to my childhood. Growing up, I had always been into clothing inspired by the street, skate and surf worlds, especially during my college years. I realized that there was this huge hole in the market for guys like myself who were looking to buy the brands that we loved—but at affordable prices. I began to research the private shopping club model that was taking off in Europe, and I set out to bring it to the U.S. and address the lack of online retail options for guys. With no initial investors, I worked endless odd jobs at night trying to make ends meet, took out credit cards and personal loans, and relied on the support of my family and friends. In total, there was $85,000 in personal debt—however, the money I earned from night and weekend jobs, as well as bootstrapping the business, ensured I was always chipping away at the debt I had accumulated. As a young entrepreneur, it’s easy to feel stuck when there is little to no funding in a project. One of the best things I did was to constantly seek help and advice from mentors, retail professionals and e-commerce experts. I had a great relationship with a professor at Ohio State, who assigned the production of my website to his class. This helped cut costs on web development that I otherwise would have incurred. Which startup hires were crucial for your company’s success? For the first two and a half years, I was the only JackThreads team member. I met my first employee a few days after I launched the site—a young guy who had just graduated from Ohio State. He fixed every bug on the website in only two weeks! It was just the two of us until we hired someone to ship packages full-time. As different tasks in the company became too much for either one of us to handle, we have hired new team members and watched our company continue to grow. However, I learned pretty quickly that hiring someone to fit a job function—rather than a role in the bigger picture—is a huge mistake. Hiring slow and waiting for the person who was the best match proved to be a much better strategy. What has been the lowest point/biggest struggle for your startup? As the company grew, I approached more and more brands and develop relationships with vendors at trade shows and conferences. Showing up at every event helped to cement these relationships, and they have proved invaluable to the business. But further down the line, I realized that I had focused so much on growth that I didn’t pay attention to the technologies we used to support customer demand. This nearly destroyed my business; we got to a point where we outgrew our technology platform and had to rebuild a brand new one in order to operate the business most efficiently. Even this has come with challenges. What has been the proudest moment of your company career…so far? One proud moment arrived when when five suitors simultaneously sought to either invest in or acquire JackThreads. It was difficult to choose who to work with and who to pass up, but I trusted my gut instinct to make one of the best business decisions I’ve ever made. We were acquired by Thrillist.com in 2010, and have been working closely together ever since. I’ve learned important lessons from Thrillist’s management and business model. Even more so, there is so much value in our collaboration, since our brands and products are featured in Thrillist’s daily e-newsletters that are sent to over 3 million subscribers. Today, we’re a $50 million dollar business with offices in SoHo, NY and separately in Columbus, OH. Our 80,000-square-f00t warehouse is located in Brooklyn. We’re constantly expanding the network of brands we’re working with, acquiring new customers, and growing our team. What unique piece of advice can you pass onto other entrepreneurs? One of the toughest careers out there is being an entrepreneur, and the only way to get through it is to be genuinely passionate about what you’re doing. I’d heard this advice a million times before, but ignored it early in my career. You have to love what you do every day, and you have to be extremely passionate about it. I created a company that was truly an extension of who I am and something I honestly cared about. That alone got me through all the hurdles that inevitably go with starting a company. What common misconception about entrepreneurship have you discovered firsthand to be completely untrue? I think it’s a misconception that you need a substantial amount of financial backing when initially launching a business. You definitely need to raise some sort of capital, but my experience creating JackThreads is proof that there are definitely ways to limit costs and do it on a bootstrapped budget. 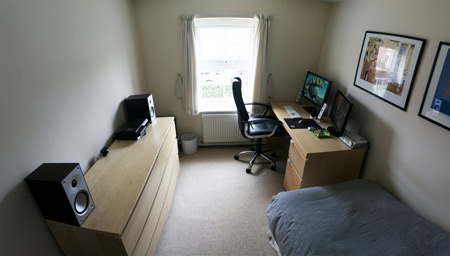 For example, instead of hiring a company to build the website, I worked with a professor in the computer science department at Ohio State University to have his students build the site as part of a class project. I also had no marketing budget in the first year, and so I cold-called blogs and other online publications with hopes that they would promote JackThreads by offering their readers special membership codes or links. In that first year alone, JackThreads reached 35,000 members without spending anything on marketing. How do you see the experience of online retail/shopping clubs changing in the future? The men’s online shopping space is currently thriving, but it’s definitely close to reaching a saturation point. I think that the trend of retailers trying to be all things to all people will eventually burn out, and the sites that really focus on a niche demographic will gain loyalty from their audience and continue to do well. 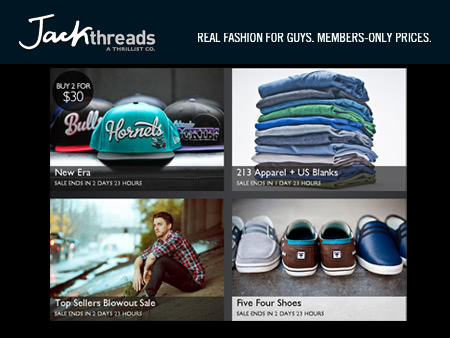 JackThreads focuses on a very specific group of guys — ages 18-35. I think there will be longevity in specificity, personalization and consistently delivering consumers products that are directly relevant to their needs. Jason Ross is the founder of member’s only men’s e-commerce site JackThreads.com. His vision was to develop an online space where the best in men’s contemporary fashion and streetwear brands could be sold at a better price than retail with a members-only premise. Jason launched JackThreads.com in late July 2008. 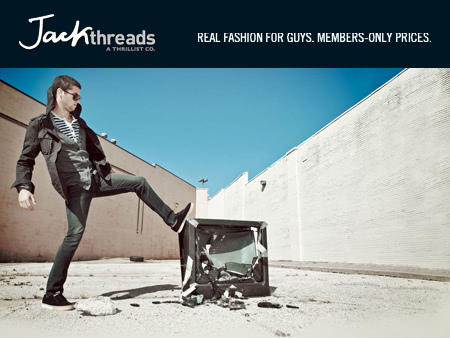 JackThreads was acquired by Thrillist.com in May 2010, but Ross continues to lead the company’s daily operations.